It wasn’t until I graduated from culinary school and started my first restaurant job that I discovered soft shell crabs. People were going crazy over these crustaceans and I couldn’t fully understand why. At first glance, the crabs were much smaller than the usual Dungeness crab that I was used to; where was all the meat?! On top of that, people were eating the crabs whole, shell and all! It seemed like madness. That is until I tried my very first soft shell crab. 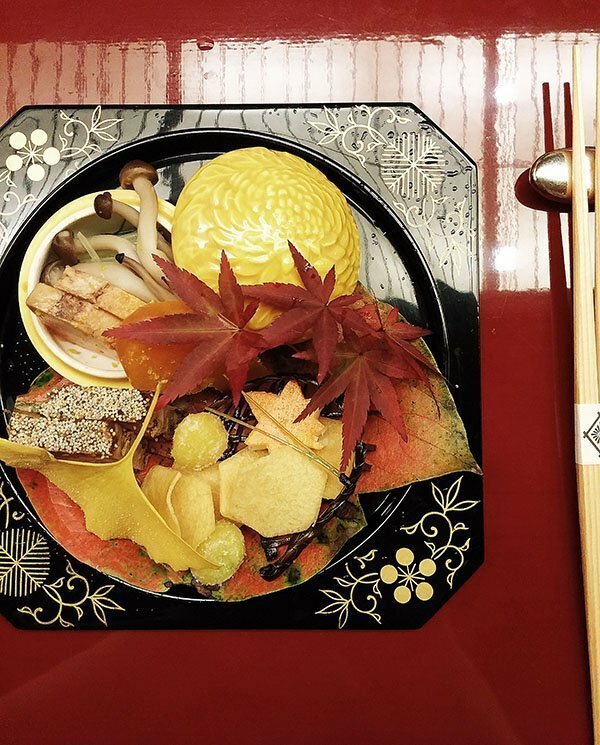 Though small in size, this particular crab was delicate and had a subtly sweet flavor. I was hooked. 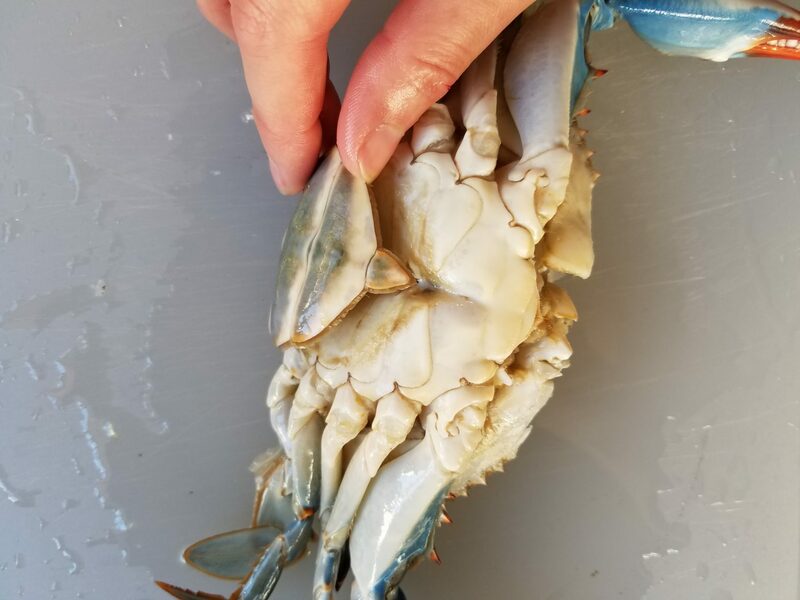 Many, many years later, I finally have come up with my own crab recipe that can be used for a soft shell, Dungeness, blue crab or king crab. 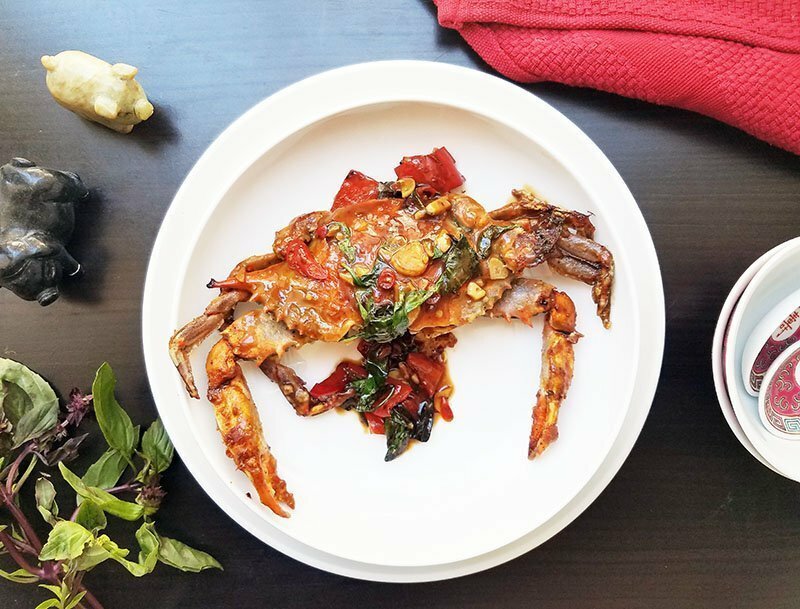 Inspired by Thai flavors, this fried crab is coated in an addicting savory chili garlic basil sauce. If you’re not a big fan of crustaceans in general, this sauce might just change your mind. 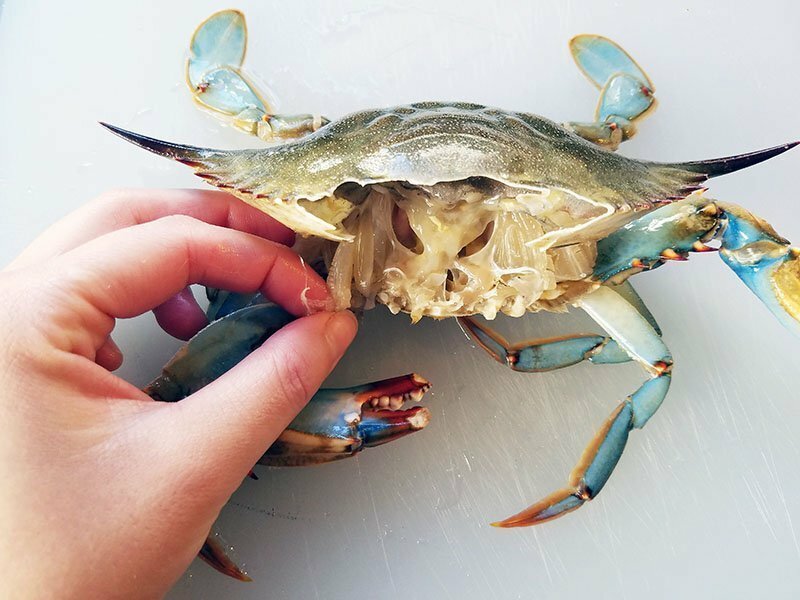 Kill and clean the crab prior to cooking. Season the flour with salt and pepper. Coat crabs in the flour mixture, shaking off excess. Dip crabs in milk and coat in flour again. Carefully drop crab into the hot oil and fry until golden brown, about 5 minutes. Remove from oil and place crabs on a paper towel lined plate. Set aside. Prepare the sauce. Heat 1 tbsp oil in large saute pan over medium-high heat. Add chopped bell pepper and saute for 2 minutes or until has softened. Add garlic and Thai chili, cooking for 30 seconds. Add chicken stock - brown sugar, and bring to a boil. Mix corn starch with 1 tbsp water to make a cornstarch slurry. Add to sauce and cook until slightly thickened, about 1 minute. Add fried crab to the sauce and toss to evenly coat. Add fresh basil and give one final stir. Serve immediately. Whenever I have the opportunity to purchase fresh crab at a decent price, I seize it. 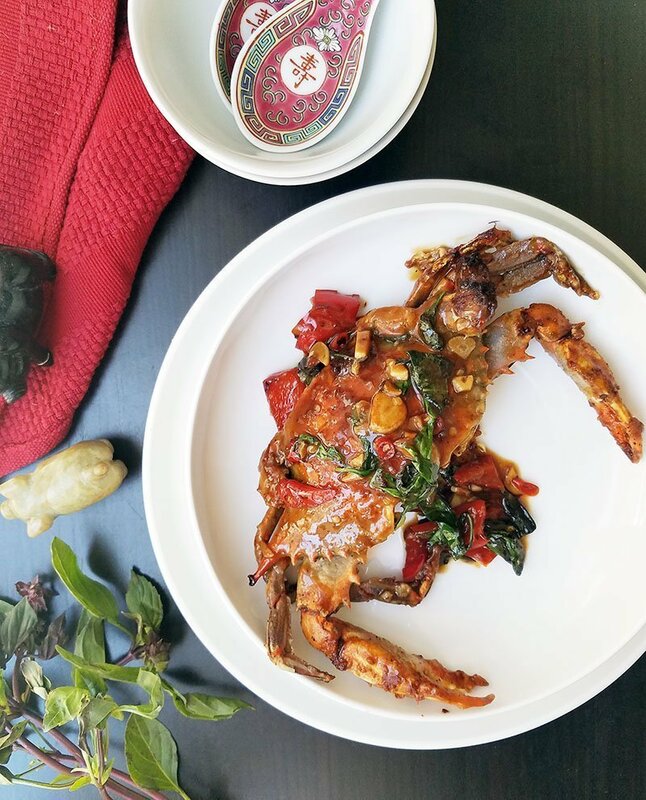 My local market happened to have a sale on fresh blue crabs so I knew I had to prepare my chili garlic basil fried crab recipe. Before frying the crabs you have to kill and clean them. If alive when purchased, pop them in the freezer for about 30 minutes to kill them. You can also blanch the crab in boiling water for 30 seconds but I prefer the no hassle of placing them in the freezer. 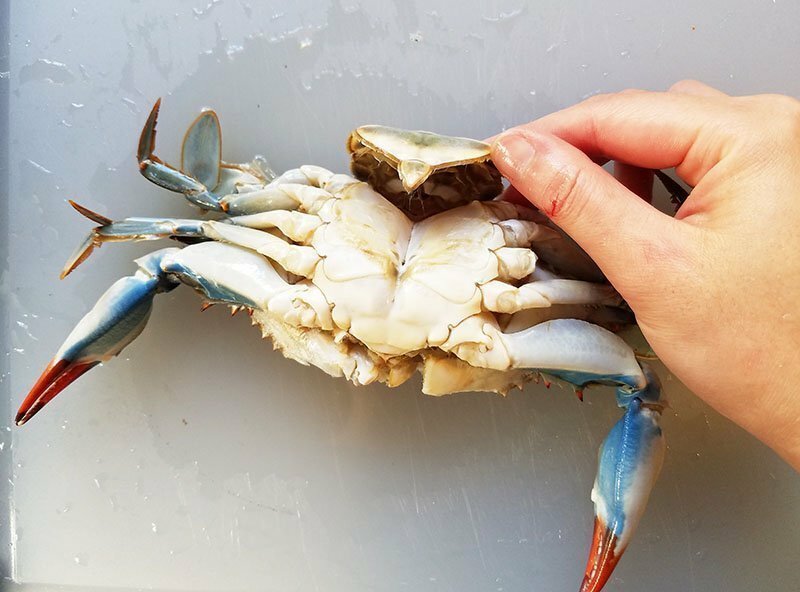 Give the crab a good rinse in cold water. 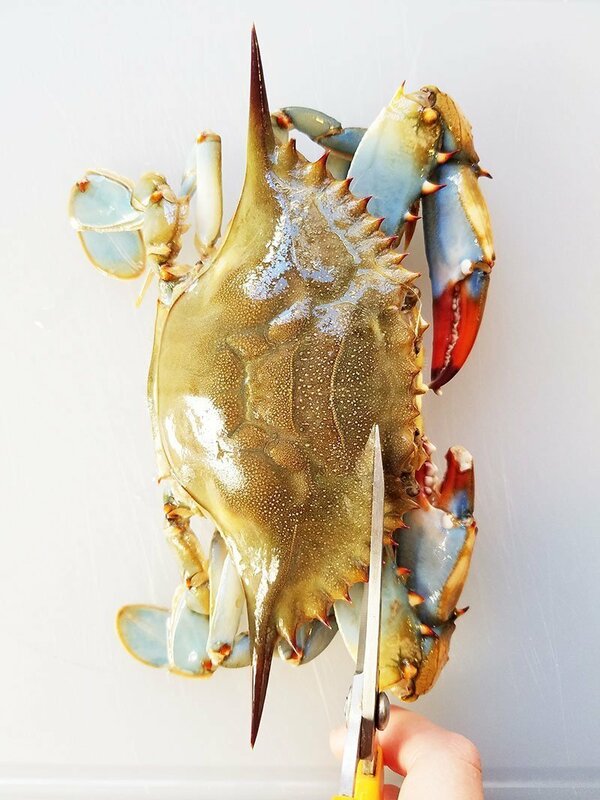 If you decided to use a soft shell crab, here are the instructions on how to clean them. First, use sharp kitchen shears or a sharp knife and cut off the face, just behind the eyes and mouth. Next, lift the top shell on the left side. Remove the beige gills and discard. Repeat on the other side. Remove the apron and discard. Now your crabs are ready to be fried! 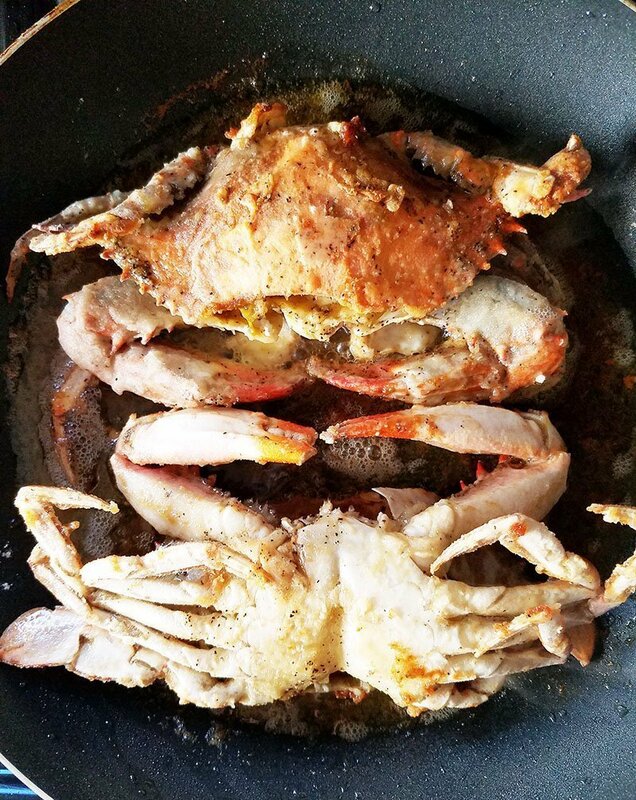 Coat the crabs in flour then milk and flour again. Gently lay them in the hot oil and fry until golden brown, about 5 minutes. Remove and repeat with the other crab. Keep the crabs warm while preparing the sauce. Saute the aromatics, add the seasonings and let the sauce come to a boil. Add the crabs and give it a good stir to evenly coat the crustaceans. Finish with basil and serve. 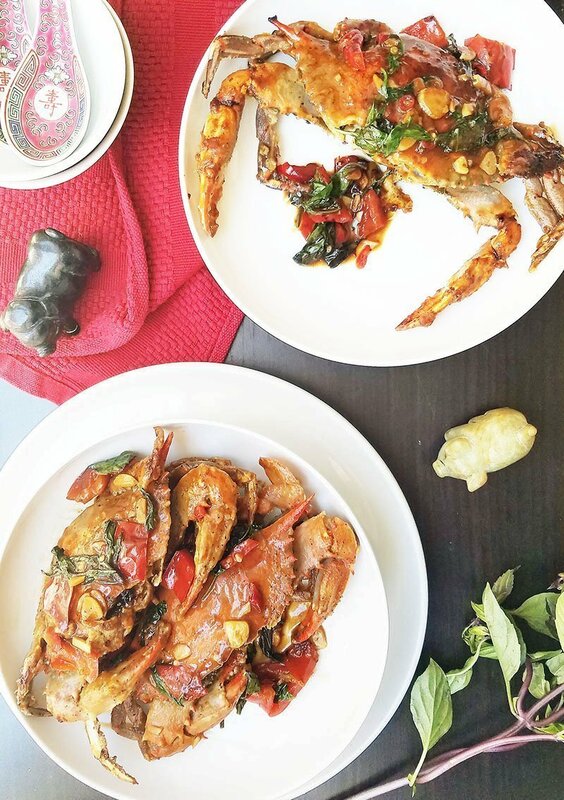 These chili garlic basil fried crabs were something else! I was licking my fingers clean every few seconds to savor the delicious sauce. Golden brown perfectly fried crabs with sweet meat inside and flavorful sauce outside. My kind of seafood!